Who knew that horses can be milked? of course once you think about it it makes sense. Why not? Timing is everything in life, we got lucky and were visiting Auez just when he and his family were milking the mares for the first time. It was was an exhilarating and fascinating experience. The wild west cowboy feeling come to life. 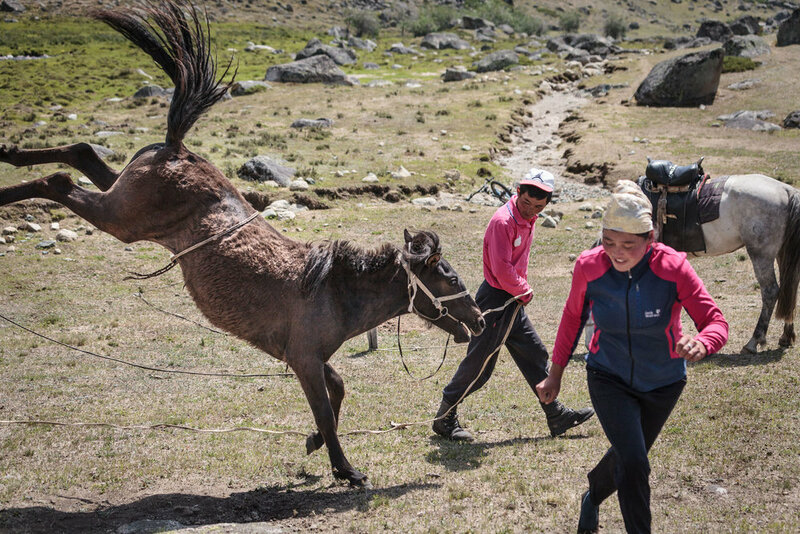 As a background it is important to understand that the Kazakh nomads LOVE fermented mares milk. It's a seasonal delicacy drunk by all including small children. Most of us visitors did not learn to appreciate the somewhat sour, slightly alcoholic flavor. As is often the case one person's misery is another's delight. Our guide, Nurka, always willing to help, systematically and happily, emptied out all of our bowls, discreetly. But first things first, before you can drink you need to milk and before you can milk you need to catch. 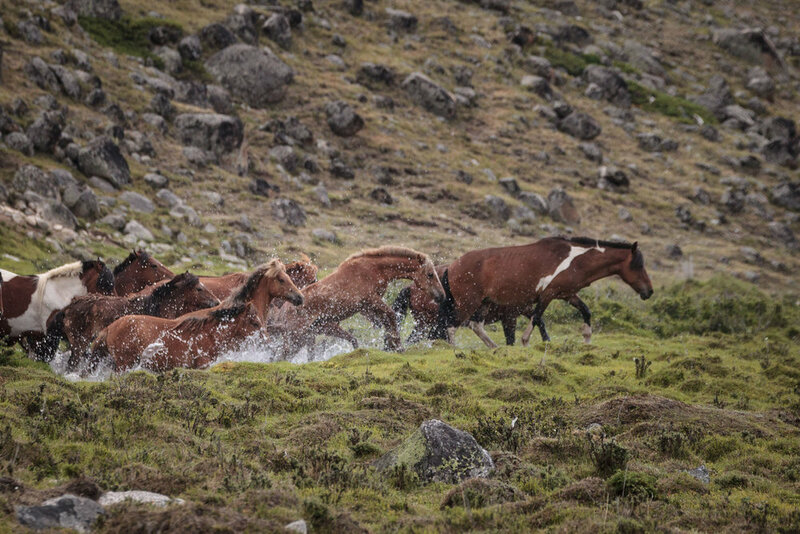 The wild horses and their foals are driven by horse riders to the selected spot where a well anchored rope is awaiting. They come charging at a fast pace. Next the foals are caught with a lasso and tied to the rope. This forces the mares to stick around as they do not want to abandon their offspring. Needless to say neither the foals nor the mares are very cooperative. It is hard physical work not without its dangers. Once all the foals are caught and roped it is time to catch the mares. This is even trickier and at times really scary to watch. Being alert and moving fast is the key to injury free survival for family members and photographer alike. Once the milking is done the Kazakh turn their attention to taming the mares. An experienced rider gets on the horse rodeo style without a saddle. After minutes of wild resistance and impressive acrobatic skills of the rider they break out for a short ride. When they return minutes later the horse is quiet and cooperative. Hours of hard physical work are rewarded by a family picnic. The meal starts with a short prayer of thanks. Tea with milk, all forms of cheese and curd, fried bread and sweets are served. And of course a vodka bottle or two are opened with the obligatory toasts. They say a woman's work is never done. Once you watch the daily routine of a Kazakh woman this rings so true. They are busy from early morning to late night working hard milking, cooking, gathering wood, preserving food for the cold winter, cleaning the Ger and of course preparing the mares milk. The milk is poured into a leather sack and a fermenting agent is added. It needs to be constantly churned, for hours. The women and children take turns churning, it is a family affair and everyone is highly motivated to get the milk ready to drink. Without a doubt, this was one of the most exciting days in Western Mongolia. Once the horses have gone through this process a few times, the excitement is over and routine settles in. They no longer resist being tied or milked.